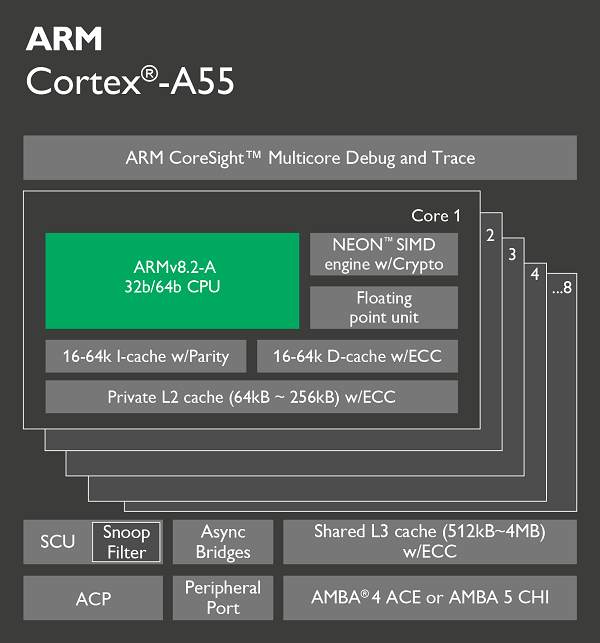 Efficient performance for all forms of computing The Arm Cortex-A55 processor is a market-leading CPU that delivers the best combination of power efficiency and performance in its class. It is part of the first generation of application CPUs based on DynamIQ technology and features the latest Arm v8-A architecture extensions, with dedicated machine learning instructions. The Cortex-A55 incorporates an extensively redesigned microarchitecture system that improves performance across the board while being very competitive in area and power efficiency. It delivers up to 18% more performance at 15% better power efficiency when compared to its predecessor, the Cortex-A53. Designed to be an extremely scalable CPU, the versatile Cortex-A55 can be used to address a wide range of applications with diverging cost, from the edge to the cloud. The Cortex-A55 can be implemented in both stand-alone applications or as a LITTLE CPU to the Cortex-A75 with DynamIQ big.LITTLE.